This nostalgia for the harsh Australian landscape was explored in works such as 'Antipodean head II' 1959, with its bark-like head. 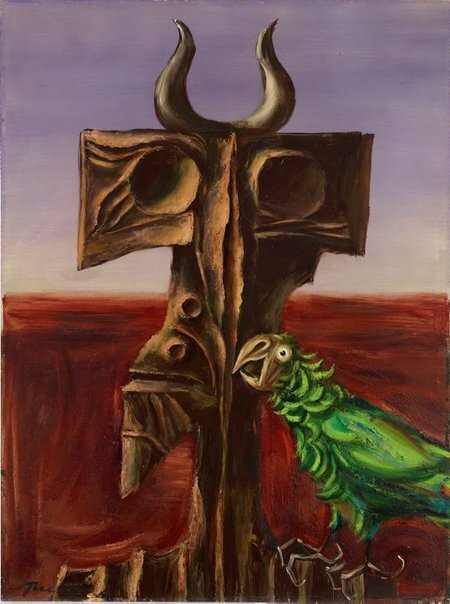 With distance from his home country and the passage of time, Tucker’s work began to move away from the religious imagery which had surrounded him in Europe – ‘the Saint Sebastians, the Christs, the Martyrs and Crosses and Virgins’ to explorers, such as Burke and Wills, masked intruders, fauns and the Ned Kelly myth, which gave his work a new focus. A double-headed axe Tucker had viewed in the Etruscan Museum, combined with the shape of Ned Kelly’s famous armour led to the development of Tucker’s distinctive angular-profile heads, seen in works including 'The intruder', which has a rough, lunar-like surface achieved through using plaster to build up the paint surface in particular areas – Tucker’s method of capturing the uniqueness of the ancient Australian landscape. Signed l.l., oil "Tucker". Not dated. Gavin Fry, The Nic Jools collection , Sydney, 2011, 78, 79 (colour illus. ).